This sweet old, double fronted cottage is tucked away down a lane in the village of Wingfield on the Wiltshire/Somerset border. It is close, by road or train, from historic Bath and 5 mins from beautiful Bradford-on-Avon and close to Longleat. We offer a warm welcome to all visitors. It's a quiet retreat from which to explore the local area and ideal for families and couples. It is an escape to the country, whilst being close to many interesting and historic places. Well behaved dogs welcome. There is a well equipped kitchen/dining room with a dishwasher, fridge/freezer, oven and induction hob as well as a Nespresso coffee machine, toaster and microwave. The front window looks out onto the pretty front garden, stuffed full of cottage garden plants, the stable door at the back allows you to look out at the back garden. The dining area has the original flagstone floors and the kitchen area has wood flooring. There are lots of cupboards and plenty of work space. The sitting room has a very comfortable 4 seater sofa and tv/dvd player and wood flooring. We will be putting a log burner shortly so it will be lovely and cosy in the autumn and winter. The upstairs bathroom has a bath with shower attachment and separate shower cubicle. Towels are supplied. There is a small snug upstairs, with an armchair and books for quieter moments. There are 2 double bedrooms; both beds are antique brass and are made up with good quality cotton bedding. Both bedrooms have additional wool rugs for chillier nights. There is a wardrobe in one bedroom and a chest of drawers in the other. Your comfort and enjoyment are really important to us and so Number 16 is furnished to the standard and style we would want when holidaying. It is a characterful, individual space which is painted throughout in Farrow and Ball and Myland paints. All linens and towels are included and a travel cot and high chair can be provided if required. There is parking for 2 cars (tandem parking) to the rear of the cottage and entry to the cottage can be via the back garden or through the front garden. I have another cottage in the same row of cottages, just 2 doors away, which sleeps 4 and a baby/infant. The HomeAway ID for this property is HUK 10022158. The village of Wingfield has a popular pub, The Poplars, which is within walking distance, a school and a church; it is a quiet base from which to explore. There are no shops in the village. An internet shop can be arranged and there is a supermarket a 7 minute drive away. I grew up in a the house behind the cottage but lived elsewhere for many years. I have recently moved back and really enjoy re-discovering the area which has so much to offer. I now live 2 doors away from this holiday property. I retired from my job in the charity sector 2 years ago and am relishing the opportunity to welcome all guests to the area. It's a quirky, interesting property with lots of old features but it is very comfortable. It is in a quiet area but close to Bath (20 mins by train/car). The cottage is in a village location but a short drive to Bath and Bradford on Avon, as well as many other places. There are lovely walks in the area. There is one pub within walking distance and others just a short drive away. The closest supermarket is in Bradford on Avon (5 mins by car) which also has lovely restaurants and a canal to cycle or walk along - you can also hire a narrow boat. It is within easy reach of Longleat, Stonehenge, Bristol, Lacock, Stourhead and many other National Trust properties. There are cinemas in Trowbridge and Frome and a theatre in Bath. There is a huge range of things to do in the area. We are within an hour's drive of Wookey Hole, Cheddar Gorge, Wilton House, Hayes Motor Museum and many other attractions for children and families. Stonehenge and Avebury are within easy driving distance. Bristol is easily accessible by train or car and the Science museum is great as is the shopping, the Clifton Suspension Bridge and the Aquarium. We are close to many lovely National Trust properties and gardens. The row of cottages which this cottage is part of are all Grade 2 listed which means nothing can be altered without permission. It therefore retains all of its old charm. Electric radiators. There is no gas in the village. Good quality, cotton sheets and duvets. In the autumn there will be a log burner. Space for 2 cars to the rear of the property. A wood stove will be installed by the autumn, with the logs for the first fire provided. Matches and firelighters provided. Feather filled, 4 seater, linen covered sofa, long coffee table, tv and cupboard with board games and a selection of dvds. The kitchen has a good amount of workspace, a fridge/freezer, microwave, coffee maker (Nespresso), toaster and kettle as well as all the essentials including a cafetiere. Pretty cottage gardens to the front and rear of the property with seats and table. We had a lovely weekend at Gillian’s cottage. We were 2 couples and one small dog and we didn’t miss anything. Lots of thoughtful touches (scones & jam on arrival, fresh eggs, lovely blankets in the bedrooms, toiletries in the bathroom, etc...) and the outdoor space was perfect for our four-legged friend. The beds were very comfortable and the house spotless. Would highly recommend. Thank you for this review. I am glad you all enjoyed your stay and found it comfortable and spotless. Thank you too for highly recommending the cottage to others. We stayed in Gillian's cottage for 3 nights and had a great time. The cottage is full of character and has everything you could need. The beds and pillows are especially comfy and the scones were greatly appreciated. Wingfield seems to be not much more than a junction but the local pub provided a great evening meal and the cottage was quiet at night. If I am returning to the area then I would certainly stay here again. We have travelled quite a lot all over Britain and we must say that this was one of the best cottages we have ever been - if not the best. The welcome was very warm and friendly and the cottage itself was extremely lovely and cosy. We would like to have stayed much longer, but this time it was not possible. But we do want to come back sometime in the near future. We enjoyed our stay at Gillian’s cottage very much. It was beautifully decorated, clean and provided everything you would need for a lovely break. Gillian was very friendly and helpful adding a nice personal touch. Would highly recommend. Thank you for this lovely review. I am so glad you enjoyed yourselves and would recommend it to others. It was so good to meet you. We had a wonderful stay in this lovely cottage. Gillian, the owner, was very welcoming and lived nearby so was on hand if we had any questions. Homemade scones, cream and jam and a bottle of prosecco were a lovely gift. The cottage was beautifully decorated and furnished throughout. Beds were extremely comfortable. We enjoyed sitting in the back garden in the evenings. 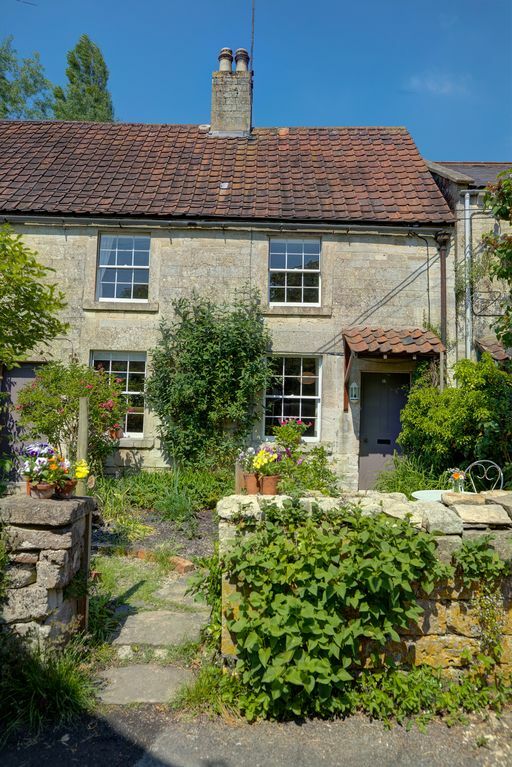 The cottage is well located and we enjoyed visiting Bradford-on-Avon, Bath, Glastonbury and lovely gardens nearby. Thank you for this lovely review. I am so glad you liked the cottage and found the beds really comfortable. I am pleased, too, that you found plenty to do in the location. Thank you so much for staying at my cottage - it was so lovely to meet you both. We were made to feel very welcome. The cottage is comfortable and well furnished.It has good inside and outside space with a lovely garden to sit in.The cottage is in a beautiful location and close to many tourist attractions in Wiltshire. We were very happy with our stay and would highly recommended this Cottage. We are very close to the beautiful city of Bath, easily accessible by train or car. We are close (5mins) also to Bradford on Avon, with its canal, architecture and walking and shopping. Longleat Safari Park and House are 25 minutes by car. Stonehenge, Avebury are approx 30 mins away. There are film locations close by and also many National Trust properties including Lacock, Court Gardens and Sturhead. The local town of Frome has been voted one of the happiest and coolest places to live. Bristol is 40 minutes away by train and London (Paddington) is just over an hours train journey from Westbury station. The cathedral city of Salisbury is an hour away. There are theatres in Frome and Bath and cinemas in Trowbridge, Bath and Frome. We are close to the Cotswolds.